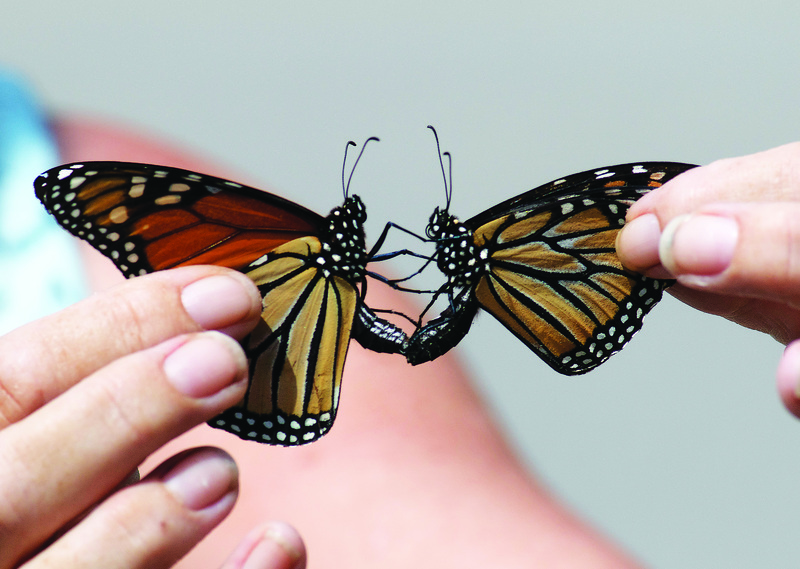 While I’ve written stories about Monarch butterflies before, and I’m sure you’ve read or watched something about their amazing migration to Mexico, this story will touch on a much darker aspect of their lives: their uncontrollable aggression. As I lounged on my friend Dianne’s front yard watching the beautiful Monarch butterflies flying around, their orange and black colouring was noticeably more vibrant indicating that they must have just hatched. We watched as dozens of them took turns landing on the plants and dancing in the air. On one plant there had to be at least 8 butterflies enjoying the sweet nectar. It’s important that we remember that butterflies are an important pollinator, just like bees. Monarch are notable for tasting bad to birds and their orange colouring serves as a warning for these predators to stay away. Everything we had seen up to this point was what I would call a ‘normal butterfly viewing experience.’ However, as my friend and I watched, two Monarchs suddenly began circling each other, chasing one another, and then landing on the driveway together. While I’ve seen butterflies flit and fly together, this seemed very different. What I didn’t know was if they were fighting or mating? I took a few photos and after zooming in on them, I was able to determine they were both male (FYI: male Monarchs have two extra black dots on their hind wings). Locked together, this pair was actually rolling around on the grass while flapping their wings furiously. At this point, I can assume they aren’t mating, but exactly why they are fighting isn’t clear yet either. I went closer than normal and tried to distract them by waving a hand over them, simulating a passing predator, to absolutely no reaction. Though I couldn’t be sure, there are only two likely reasons the butterflies would engage like this: fighting for control of food, or for females. It turns out that while dozens of females may be peacefully flying around a yard from flower to flower, one dominant male will likely be patrolling high in the air watching over his entire domain and preparing to chase away or attack any other male Monarch that approaches. This is a never-ending battle as the chased-away males will only wait a few minutes after leaving before trying to encroach again. Over the course of an hour, my friend and I saw two more fights on the ground and many more in the air. Amazingly, some of the butterflies even chased away some of the goldfinches and sparrows that came into the yard looking for seeds. • Did you know that they can flap their wings up to 120 times a minute?